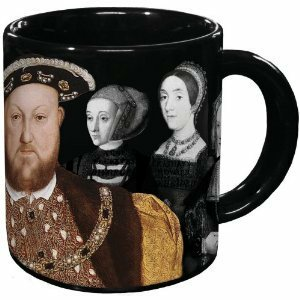 History comes alive with our remarkable Disappearing Wives of Henry VIII Mug. This large mug features images of King Henry and all six of his wives. When you pour in any hot beverage, the poor wives vanish, leaving behind their outlines, names, and the manner in which they departed Henry's company. Anne Boleyn and Kathryn Howard were executed. Catherine of Aragon and Anne of Cleves got divorced. Jane Seymour died. And Katherine Parr was the lucky winner by being widowed. This is one amazing mug, and is sure to fascinate you every time.